A web-based interface to give clients a better overview of their candidate pipeline, conversion metrics and details around incoming candidates in order to streamline the recruiting process. Hiring great talent is a complex process that requires organization and coordination among various parts of a company. Keeping track of candidates and feedback from interviews are just some of the major workflow challenges. - Identify the users of this platform. What are their needs? How would these translate into features of the product? 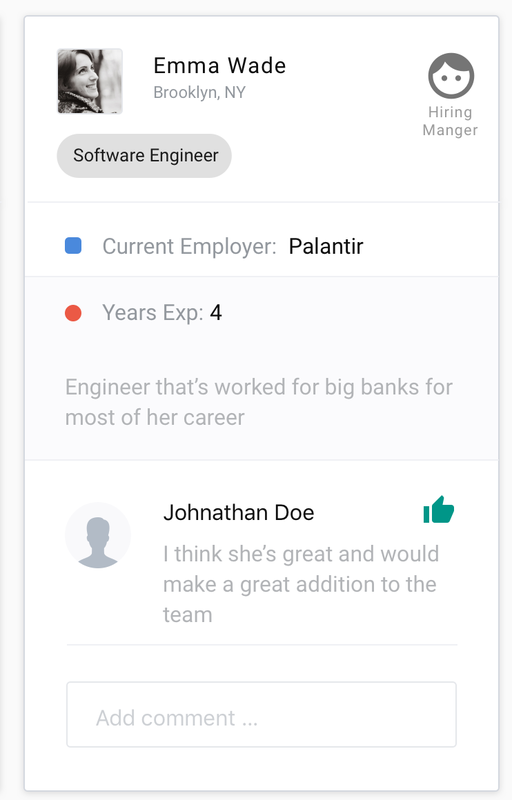 - How would you display the candidates that are in the hiring pipeline? How would a hiring manager find or search for a specific candidate? - What would be an effective way to keep track of a candidate’s progress? - How would you collect useful feedback from interviews? What would that flow look like? - How can the user compare different candidates’ information in order to make a hiring decision? - How would you display conversion rates/metrics based on different job boards or candidate background/traits? What are other important metrics to display? Five different personas were identified as potential users involved throughout the entire candidate hiring process.